A luxury 747 carrying valuable art work is hijacked and lands in the ocean, submerged in shallow water. Will the crew and passengers make it off before the plane floods with water? While I didn’t care for it, at least 1970’s Airport deserves some recognition for its pedigree. It largely launched the Seventies’ disaster genre, and it received a surprising number of accolades; it garnered 10 Oscar nominations, including one for Best Picture. 1974’s Airport 1975 didn’t muster the same level of praise or innovation, but it did fine for itself. The movie performed well at the box office. It also stands as probably the most entertaining of the series. So what about 1977’s Airport ‘77? It offers probably the most notable cast of the bunch but falls short in virtually every other way. It’s not the worst Airport movie, but only the insane ineptitude of Airport ’79… The Concorde prevents that ignominy. Aviation mogul Philip Stevens (James Stewart) decides to open his Palm Beach mansion as a museum. He uses his own personalized 747 to transport the guests. 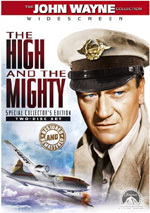 Captain Don Gallagher (Jack Lemmon) acts as pilot of this craft. His longtime girlfriend Eve Clayton (Brenda Vaccaro) will come along as well. Don wants to finally get married, but she’s not so sure, partially because she wants to relocate from DC to Geneva for work. Intrigue starts immediately when we see a shifty-looking dude switch briefcases with a pilot. He disguises himself as a worker to get aboard the Stevens plane where he and a compatriot plant gas tanks on the aircraft. He then settles in as a waiter to later execute his nefarious plan. In the meantime, the guests arrive on the plane. They include wealthy art patron Emily Livingston (Olivia de Havilland), her old friend Nicholas St. Downs III (Joseph Cotten), Martin Wallace (Christopher Lee), adulterous wife Karen (Lee Grant), her consort – and Martin’s partner – Frank Powers (Gil Gerard), and Stevens’ estranged daughter Lisa (Pamela Bellwood). All socialize while we wait for the baddies to do their thing. Abetted by other conspirators on board the plane, they eventually do so. They knock out the aircraft’s security guard as well as Don, and they render everyone else unconscious when they flood the jet with gas. They plan to fly the plane off-course and disappear into the Bermuda Triangle where they’ll land on an island, unload all the jet’s valuable art headed to the museum, and take off with their fortune. This doesn’t work out as planned. While they fly under the radar, they clip an offshore drilling rig and crash into the ocean. This kills a few, injures more, and leaves the survivors trapped on the sea floor. They attempt to cope with their situation and survive while they await rescue. What the heck ever happened to the Bermuda Triangle? Back in the Seventies, we heard mysterious, spooky tales about it all the time, but now it seems to have fallen into oblivion. Did the space monkeys who resided there return to their home world or something? Not that the Triangle gets much more than lip service in this fairly standard mix of caper flick and disaster adventure. I remember how much attention the Triangle received during this era, so I expect the producers of ’77 incorporated it to garner a little attention for the project. I’m surprised they didn’t put Bigfoot on the plane as a co-pilot as well. ’77 needs all the gimmicks it can get, for it sure doesn’t produce any excitement. Each movie spends less and less time with exposition before it gets to the intrigue. This leads one to believe that Concorde will have an explosion during – or perhaps before - the opening credits. 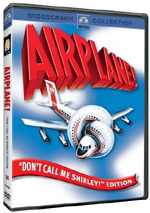 ’77 zips through its character introductions and scenario set-ups to get to the plane crash. I suppose this is better than the tediously long-winded exposition seen in Airport and The High and the Mighty, but it means that we really don’t give two hoots about most of the characters. That occurs despite the stellar talents on display. How is it possible that a movie with James Stewart, Jack Lemmon, Olivia de Havilland, and Joseph Cotten among others can stink so badly? It seems almost impossible, but ’77 manages to turn that trick. Actually, the best performance of the lot – and the only one that stands out from the crowd – comes from Lee Grant. She invests her predictable drunken harpy with a liveliness absent from the rest of the somnambulant cast. I sense the others turned in pedestrian work and showed up here just for their paychecks. Grant veers toward the campy side of the street, but at least she brings some oomph to the film. Unfortunately, she can’t enliven the whole flick on her own. ’77 goes down as the most boring of the series, no mean feat given the tedium onscreen during the original Airport. It simply lacks much intrigue, and it also fails to deliver the cheesy goofiness of 1975. The movie doesn’t quite play things straight, but it doesn’t go for the earlier film’s campy gusto. Part of the problem comes from the movie’s focus on the rescue. Granted, I suppose that’s inevitable, as most disaster flicks concentrate mainly on how the characters try to get out of their predicament. After all, you can’t run two hours of constant catastrophe. Unfortunately, ’77 fails to balance the two sides. It feels like engineers wrote it. The movie focuses on the logistics of the situation and ignores the drama and excitement. This makes the rescue scenes slow and tedious. The series’ continued involvement of George Kennedy’s Patroni character gets more and more ridiculous with each new flick. This’ll reach its peak of absurdity in Concorde, but ’77 stretches badly to include him. Boy, that Patroni sure gets around! Apparently he can’t hold a job, as he works for a different airline in each movie. It also seems unclear why he ends up as part of this search. Kennedy gets less to do here than in any of the other three efforts. He appears as a token link to the rest of the series and offers little more than a cameo. Airport ‘77 goes down as a really dull film. It doesn’t seem satisfying for disaster lovers, though at least it doesn’t just remake the first two. I appreciate its attempts to differentiate itself from the other flicks, but it simply lacks excitement or anything compelling. 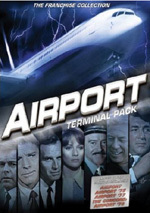 Airport ‘77 appears in an aspect ratio of approximately 2.35:1 on this double-sided, double-layered DVD; the image has been enhanced for 16X9 televisions. Despite some definite strengths, some weaknesses harmed the transfer. Most of those stemmed from source flaws. Especially during the flick’s first two-thirds, quite a lot of speckles popped up, and I also noticed grit and other marks. The film cleaned up during its final act, though it still showed sporadic issues. Shimmering was also a problem, largely due to clothes. Check out James Stewart’s suit early in the film and watch it strobe! I noticed no concerns with jagged edges, and edge enhancement was minimal. Sharpness usually seemed satisfying. A few wider shots appeared a little off, but those didn’t create many distractions. Instead, the film was generally concise and accurate. Colors displayed good vivacity and life, while blacks were dense and tight. Underwater photography mostly demonstrated nice definition. Some of the shots were a little murky, but not many. Really, the source defects were the primary problem. Otherwise this was a pretty solid image. The monaural audio of Airport ‘77 seemed perfectly adequate. Speech offered more than acceptable delineation and clarity, with no edginess or issues connected to intelligibility. Effects could be slightly rough at times, primarily in regard to the high end of the register, but they usually provided reasonably accuracy and definition. Music fared better, as the score was fairly rich and full given the limits of the source material. This wasn’t a great track, but it satisfied. As with the other Airport flicks, this one comes with almost no extras. We simply find the film’s trailer and nothing else. A tedious and dull disaster movie, Airport ‘77 didn’t live up to its potential. With an excellent cast and a theoretically interesting scenario, the film could have been the best of the series. Unfortunately, it bores us to death with its endless focus on logistics. The DVD offers somewhat better than average picture and sound but lacks significant supplements. Leave this dull clunker on the shelf. Note that Universal currently makes Airport ‘77 available only as part of the four-film Airport Terminal Pack. This also includes the original Airport plus sequels Airport 1975 and The Concorde… Airport ‘79. Some may grouse that you can’t buy the flicks individually, but with a list price of less than $20 for all four, it’s hard to complain.